Several weeks ago while visiting the local book store EMPIRE April 2007, a movie magazine caught my attention. For those who don't know, EMPIRE is imported from the United Kingdom and features film articles. The slick looking attention grabbing cover showcases the upcoming Fantastic Four: The Rise of the Silver Surfer, a film I'm greatly looking forward to. I enjoyed the first installment and have been a big fan of both the Jack Kirby (the creator) and John Byrne issues in their respected Marvel comic book era's. They were great adventures and fun reading, I hope the new film follows this theme. Eager to get home, I purchased the magazine based on the cover alone. 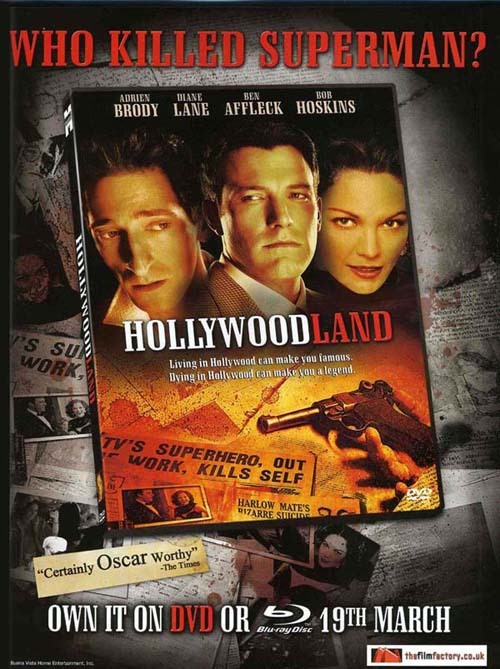 As I started my journey through the various subjects contained within this magazine unexpectedly there was an advertisement for the March 19, 2007 Hollywoodland DVD release. Of course this date being a little over a month after the United States DVD release date. That's how it is, the British Pound currency is far better than the US Dollar, but we get movies in theater and DVD releases much sooner. And so, after much has been discussed, plus or minus regarding the film last year, this advertisement takes on just one more absolute inaccuracy. Well, actually...two if you count the big bold statement at the very top, "WHO KILLED SUPERMAN?" With the US release of Hollywoodland, September 8, 2006 has become a day when George Reeves died...again. I suppose we who consider ourselves loyal to the George Reeves name have come to accept that those in the news and entertainment media will not and cannot separate the fact that it was George Reeves who died and not the fictional character named "Superman." Even in modern times countless newspapers and magazines continue to exploit a subject they know very little about. It seems to me it's the media who cannot make the separation. It can't be they believe it was truly Superman who died June 16, 1959. Personally, it seems odd to me any respectful journalist would perpetuate a misconception and not be moreso sensitive to a tragic death. It is the media who has often treated those who grew up with the Adventures of Superman as those who cannot separate George Reeves from the fictional character "Superman." I can only surmise the news must think it is a great headline in some sort of morbid way. The headlines with the word inserted SUPERMAN make for a sensational attention grabber. Mr. Christopher Reeve was given no better treatment when he had his accident in 1995. Newspapers in 1959 are mainly at fault when they created the rampant headlines related to this case. If it is meant for a "sold out" campaign, I think it's a cheap and downright despicable method. But that's just me. They are the companies cutting down trees for paper, so they have to pay for that somehow. Oh, and make a profit. To continue to place "Superman" and George Reeves in the same place on the night of June 16, 1959 is inexcusable, inconsiderate and in absolute poor taste. "Superman" did not die. The fictional character of "Superman" lived on to generate millions upon millions of dollars globally by the sale of box-office sales, coffee mugs, pillow case and bed spreads, posters, action figures, trading cards, comic books and many other related merchandise. The total is far more than the income all the actors who protrayed Superman on film could ever have earned or dreamed of earning. The individual whose final moment came on the night of June 15-16th, 1959 is known as George Keefer-Brewer-Bessolo-Reeves. He stood 6'1'', weighed 190 lbs, had a taste for social drink, was an actor by profession, was involved in numerous charities that included the Myasthenia Gravis Foundation and City of Hope for Leukemia. He visited countless cancer hospital wards for children. In doing so, personal attention was not his agenda. His only intention was to bring a message of bravery to these many children whose lives hung in the balance of hope. His presence would joyfully take their minds off their illness, even if it were for just one day. Who would forget they were visited by George Reeves, the man who as an actor by trade played "Superman" on TV? Mr. Reeves had blue eyes, a great smile and could sing Spanish songs fluently while playing guitar. These songs were taught to him by his life long best friend Natividad Vacio, a gentle and considerate man in his own right. Mr. Reeves knew safety was important to the well being of the millions of children who watched his show. He often stressed to them not to emulate the fictitious "Super" feats they saw on TV, especially the flying. He would credit studio trick photography for these effects. His concern earned him awards and recognition for child safety. Mr. Reeves also had a lady friend who showered him with expensive gifts, perhaps her way of helping him achieve stardom by having a star quality appearance. He was not without his appreciation but would eventually prove to her money wasn't important for his gains in life. It is more important to reflect on the good things in life and how one carries him or herself respectfully. This is the George Reeves I've come to learn about from those who knew him and considered him their good friend. I hope someday the media will care to understand this is how George Reeves lived and what he stood for. The media should only know half of the humanitarian qualities of Mr. George Reeves. It is time for the fictitious character "Superman" to be separated from the death of George Reeves. "Superman,: the fictious character was one of many character roles performed by George Reeves, the actor. Upon viewing the DVD advertisement you will notice a blatant inaccuracy. In the lower right corner of the DVD box is a facsimile of the luger pistol, the weapon known to have brought an end to the life of Mr. Reeves. You will note it is contained in the palm of a right hand, that of the film's main character. It would imply the individual committed suicide. Perhaps he did. Then again, perhaps he didn't. And so why after so many months since the film was released and all described in Flight of the Innocent would this subject need to be addressed again? What more could be said to make it known the film stands all alone on its own merit with little effort to provide correct information. Fiction it would describe itself. Indeed, in all the wrong places. It still doesn't make it right. At best the film does indulge the audience to know there are three mysterious theories known to exist regarding the death of George Reeves. Why has this film, along with every television segment, magazine articles, book published before Hollywoodland ever existed told of the same three mysterious theories? Because even after the official ruling of suicide, there exist contrary reasons to believe the death was a result of some other action. Simply put, the official ruling is suspect because there exist many unanswered questions. Questions the official investigators didn't bother to resolve. It should be known, that actually there are about ten varied theories ranging from a mog hit due to gambling debts, to a jealous husband and an irate lumber truck owner. While anything is possible, these theories remain far less likely, more rediculas to those with extreme knowledge of this case. The most offered to readers involving this case is the book Speeding Bullet: The Life and Bizarre Death of George Reeves by Jan Alan Henderson. Jan was the first to provide an intellectual account of all the theories in his Cult Movies magazine format. However no one, especially Hollywoodland can stake a claim to be the innovator or originator of the three theories. Just read the June-July 1959 newspapers and one can easily draw the suspicion that something wasn't right in Los Angeles. Many people did, including those who knew George well enough to know he'd never commit suicide. But even if they were wrong, their input as character witnesses were brushed aside. Even the children of the time knew it didn't make sense as the case unraveled for more than a month. Proving they were a lot smarter than everyone gave them credit for. Thank goodness for free thinking. Unfortunately public opinion carries little weight if the opinion comes from an adolescent. Who takes a child serious? Parents often will boast how smart and intelligent their toddler is for even the simpliest act of rolling a ball. Then one day the child has learned to speak and things change. Parents most likely had the same suspicions about this case, but had more immediate concerns on their minds like work, and running a home. Perhaps the parents would sigh in relief not having to worry their child would pin a towel to their shoulders to articulate the fictional character "Superman's" cape and jump out a window or off a roof . But the worry didn't end for the parents since the Adventures of Superman remained popular, a monetary juggernut by an enormous margin and remained on the broadcasting airwaves for many years and now a DVD boxset success. History will show the National Periodicals knew George Reeves could not be easily replaced. He remained the motion picture fictional character "Superman" until 1978 when Christopher Reeve starred in Superman: The Movie. While the organization tried to suppress TAoS in favor of its new investment, George would still be the icon to be compared with. He set the bar. Always has been, always will be. Warner Brothers would elevate Superman: The Movie to a far superior production level compared to the TV Superman, however there was nothing National Periodicals could do to eliminate George's fictional character "Superman" from the minds of entertained American baby boomers. In the early 90's at a Stoney Brook, NY sci-fi convention on Long Island I happened upon Julius Schwartz, then a VP at DC Comics. I asked him if he had any fondness for the Adventures of Superman and his response was, "oh who cares about that old stuff?" Completely flabbergasted I responded "Well, I do." Mr. Schwartz gracefully moved on. Noting he had no affection for his own product of his time, engaging in the importance of the show and its credibility would be senseless, so did I. George nonetheless remains strong and rightly so. Thankfully, the organization has people like Paul Levitz who does care about its history and what it took to be where it is today. I think even Mr. Levitz would agree, alive and working together for a high standard of ethics George Reeves and the fictious character "Superman" could share a synonomous mission. It is an honor to be a part of a wonderful idea created by Jerry Siegel and Joe Shuster. In the tragic death of a man, the fictious character "Superman" and George Reeves have gone their separate ways. Whether the official ruling of suicide is true or not, we will propably never know exactly how George's life ended at age 45. It remains a mystery only because of the many open ended questions. The very same questions that should have been answered in June 1959, but were suppressed. Even Hollywoodland overlooked the obvious. Again, why re-visit the Hollywoodland subject? Because it is bothersome the producers of this film continue to exploit the elements of the case even after so much has already been corrected for historical reasons and not allowing more convoluted information to enter the case. The people of Hollywoodland claim they care, but do they really? They continue to place misleading information in the public eye, even within the foreign market where it is less likely to be identified. To the best of my knowledge I don't recall any US advertisements of DVD boxes containing this false impression. For the record, there is no mystery surrounding the gun location when the police arrived at the crime scene. It was on the floor between the feet of the corpse. Is the gun location important to the case? Yes, absolutely. It cannot be treated in an acedemic sort of way or "what difference does it make?" It is equally important for those who are discovering this case for the first time to have the correct facts, including whether or not there are five bullet holes in the floor or two. All such clues and evidence is extremely important as are all pieces of the puzzle. Some elements being false, some true. Maybe Hollywoodland has intelligence the public didn't have at the time. It's highly doubtful. If they believe the gun remained in the hand after the fatal shot, then perhaps this confirms they don't know the case. If they want to fall back on the comment: "It's just a movie." Perhaps they had no business making the film unless they did know the case inside and out. It has always been known and remains today the gun was not in the hand at the time the police arrived at the crime scene. The image on the DVD box is wrong. Why does the studio continue to put misleading information in the public view? Your guess is as good as anyone's. Fiction does not bring us closer to the truth. It only skews it. Obvious they had time to approve or disapprove this UK advertisement. But they allowed it nonetheless. Anyway, I cannot answer these questions, I just thought I should let you know about it. So whether it's June 16, 1959, September 8, 2006, March 19, 2007, today or tomorrow, George Reeves will be known as more than just a date or a footnote in a historical writing of Hollywood. He will forever be engrained in our minds as a decent person, always ready to help anyone. We know he was far from perfect. Who alive can make that distinctive claim? Who can claim to enrich the hearts of others? Well my friends, if George were alive, he could. The Adventures Continue (TAC) is a website devoted to George Reeves and the Adventures of Superman. All contents copyright&COPY; by Jim Nolt unless otherwise noted. All rights reserved. Nothing from this website may be reproduced by any means, in whole or in part (excpet for brief passaged used solely for review purposes) without the written permission of either Jim Nolt (owner) and/or Lou Koza (editor). The feature above titled Hollywoodland - The United Kingdon DVD Advertisement is the copyright and ownership of Lou Koza and cannot be reproduced by any means, in whole or in part without Mr. Koza's written permission. Superman and all related indicia are trademarks of DC Comics, Inc. and are reproduced for historical purposes only. Use of the name of any product or character without mention of trademark status should not be construed as a challenge to such status. Includes the video captures from The Adventures of Superman.